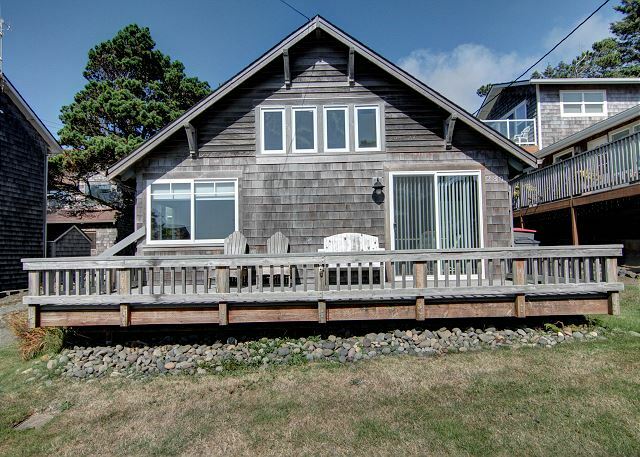 Babe's Beach House, named for Babe Cone who loved Cannon Beach, is a warm and cozy but spacious bungalow. 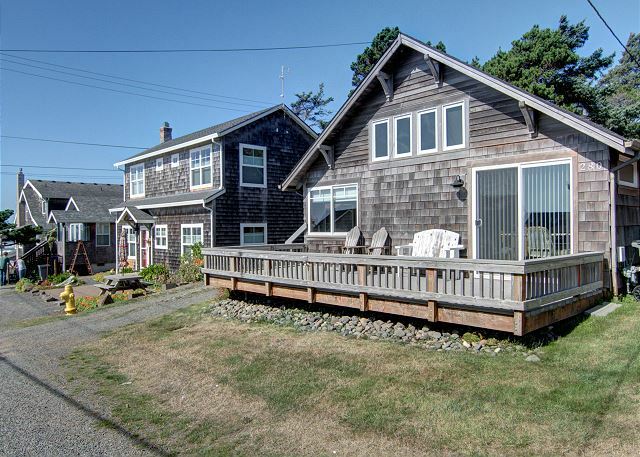 It has a wide and wonderful ocean view from the front room, which includes the living room, dining room, and kitchen, as well as from its large front deck. Nestled in the north end of Cannon Beach's Tolovana neighborhood, beach access is only a few steps away. Once on the beach, you can wander for hours to the cry of the gulls or take an easy walk to the tide pools of Haystack Rock. Winter storm watching is a breeze, with comfortable indoor viewing. And it's just a nice walk or short drive to shopping, galleries, and dining in Tolovana, Mid-Town or downtown Cannon Beach. This 3-bedroom home has 2 queen-size and 1 full-size beds, made from natural, organic, and sustainable materials with luscious cotton sheets and quality pillows and comforters. Two recently remodeled bathrooms offer whimsical touches and all the comforts of home. 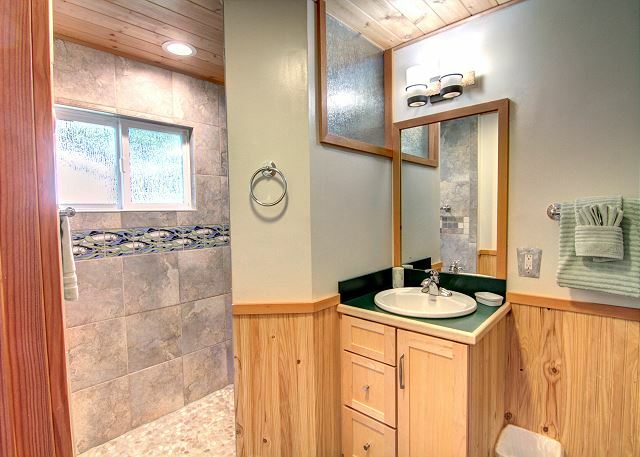 One has a large walk-in shower, the other a tub/shower combo, both with natural light. 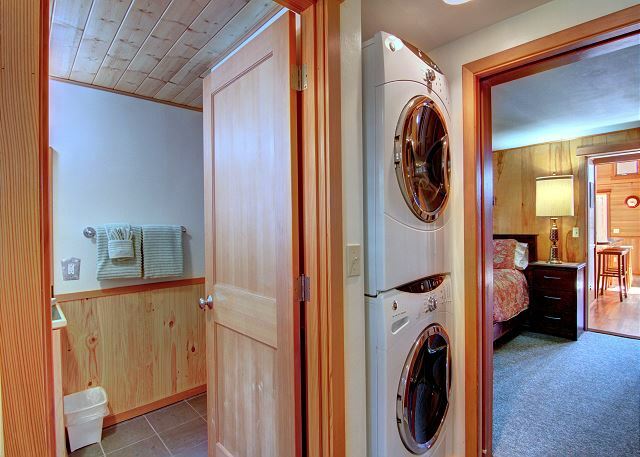 In the back hallway a full-size washer and dryer make cleaning up a breeze. 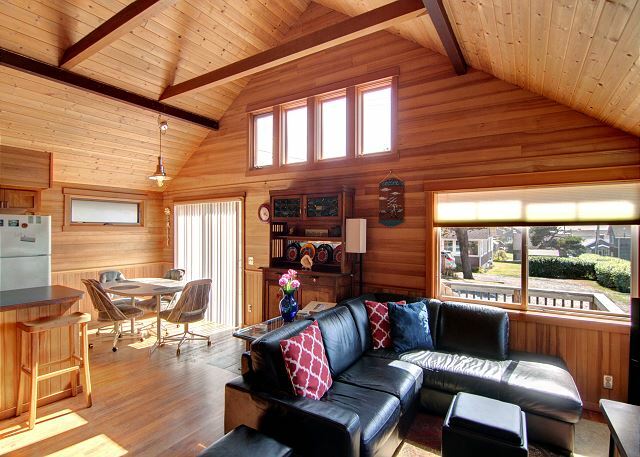 The cedar-paneled front room features a cathedral ceiling, lots of natural light, and a comfortable leather couch from which to enjoy a great view of the ocean waves or a winter storm, read a good book or watch a movie, all while sipping on your favorite beverage. A high-definition, wide-screen TV, a DVD/Blu-Ray player, Wireless Internet, and a multi-speaker sound system add to your entertainment pleasure. The well-supplied kitchen with a gas stove and oven makes meals quick and easy for either simple or more creative cooking. A coffee grinder, coffee maker, teapots, toaster, full size refrigerator/freezer, and small dishwasher add to the ease of meal preparation and cleanup. Dogs are welcome at Babe's Beach House. A large fenced backyard provides a play area, shade, and, during the warmer seasons, a large gas grill. In good weather, the large deck out front offers a great place to take in the view, sounds, and smells of the ocean. Come and enjoy our wonderful ocean view get-away. Share it with friends or family or treat it as a hide away all to yourself for some peace and relaxation. Either way, experience nature's splendor at Babe's Beach House in Cannon Beach, Oregon, creating memories that can last a lifetime. Accommodates 7 maximum; pets welcome; no smoking; parking for 3 vehicles. "This year the weather was better than we expected. Just being here is exceptional. There’s something about the waves, the short distance from sand to ocean, Hatstack Rock, the mountains, the sunrises, the sunsets. My favorite PNW spot. It also helps knowing CBPM is there for any issues that come up. They’re always down to earth friendly and they value me - the personal feeling helps me want to stay with their properties. " Thank you Vickie! It is always good to see you, come back soon! "Location of the house is great & so is the view for being 4 houses up the street. We have 2 dogs we bring every year so we love the fenced back yard. House has all that we need except we bring a TV tray to put at the end of the couch as an end table. 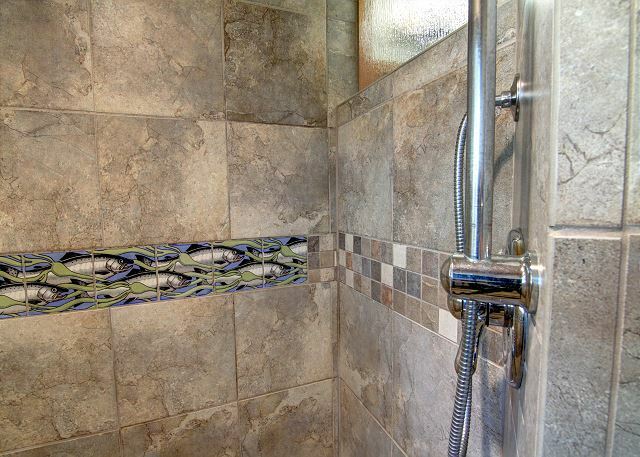 The walk in shower is excellent for rinsing off the dogs after a romp at the beach. " "The weather. Sea Level coffee and bakery was an every morning stop." "We have been coming to Cannon Beach for 3 years to celebrate our anniversary and Babe's is a wonderful place to stay. The house is cozy, the views are awesome and a quick walk to the beach. Highly recommend!" Happy Anniversary! We are happy to hear you did stay with us for your very important day! Looking forward to next year same time at Babe's Beach House. "This is a lovely, lovely beach cottage with a spectacular view of the ocean from the living room/ kitchen area and very close beach access. We were five adults and one child. This space was great for us. Several reviewers mention that you have to go through one bedroom to get to the bedroom in the back, but you also go through the laundry area. The bedrooms are not adjacent to each other. We thought the layout of this house was great for the small space, and the location was superior. We had a lovely, relaxing vacation." "Great place for a family vacation. The house is a couple houses up from the beach and has a great view out the front window and from the deck. If you like to walk this is the place - go north about a mile and you'll hit town, or south and you are in the Tolovana area. Easy access to the beach. The one thing I would recommend this house for a family more than for a group of friends. The layout for one of the bedrooms doesn't allow much privacy - you have to walk through one to get to the bedroom in the back of the house. Other than that, we had a lot of fun and really enjoyed the time together! " "This is a great property and location. Perfect!!!" "We have travelled to CB for over 12 years and each year has given us many wonderful memories. The people at CBPM are always excellent and provide A+ service. Babe's is the perfect location, huge deck with a view and a rear yard for BBQ and conversation. Only downside was the RV traffic during the holiday on this small dead end street, but once the dust cleared it one amazing day after another. " "Had a great stay. Everything was wonderful. The house was clean and comfortable. The location was fantastic, good view and close to the beach, easy walking distance to town. We will be back!" "Great house! We're returning customers. The back bedroom change from futon bunks to full bed was our reason to rent again. Along with a fully fenced backyard for our two dogs. Property management brought out patio furniture per our request as the weather was 80 for most of our stay." "The view from the front room is fabulous, and we even had some lovely weather to enjoy that view from the deck. Well stocked kitchen; excellent beach access close by. The home is dog-friendly and having a fenced back yard is a plus. " "Enjoyed finally getting a chance to try this popular rental. While not a large cabin, the space is very well used and all three bedrooms and both bathrooms are very nice and comfortable. The fenced back yard is great for dog owners. (Bunnies live all around and are cute to look at, but possibly a bit of an issue for reactive, prey driven dogs) Just a house or two away from sturdy stairs down to the beach, just south of Haystack. We cooked and found everything we needed by way of pots and pans, utensils and dishes. Nice coffe pot and dishwasher. The entertainment system worked fine - we did have trouble with our internet connection half way through our stay - possibly a router issue - but I'm sure the management company will have that sorted out immediately. (We didn't really need it, so just let it be for the last day of our stay, but they were concerned and responsive to the problem when we reported it.). We found Babe's to be another winner!" "This was a perfect place for our family to spend the Thanksgiving weekend. Very clean, deck with beautiful view of the ocean and dog friendly! We would definitely come back and stay here again." "Thank you again CBPM for all your assistance in helping us achieve yet another enjoyable stay at Babe's. Weather was great, whale watching was a added surprise and the deck made the nightly viewing even more special. We look forward to next years visit. " "We'll be back for sure!" "We enjoyed our stay and appreciated both the location, close to beach and Haystack, and the cozy home. " "We spent 3 nights here at Babes Beach House along with our three children. We loved the location and the layout of the house was so that everyone had their privacy. The views from the living room, kitchen and dining were just beautiful. It was just a short walk to the beach and Haystack Rock. We have already booked again for next year for a full week. The house was very clean and comfortable which is very important to us The deck was a great place to hang out with the kids and just enjoy the view." "My husband and I spent four nights at Babe's with my sister, our daughter, and our aging dog. The house is well appointed and modern inside, with a reasonably well stocked kitchen, great gas stove, a walk-in shower in one bathroom and a tub in the other, and a little dishwasher. The deck is perfect for reading and looking at the ocean, and there's a nice back yard for the dog to lie in (though it lacks any outdoor furniture such as a picnic table). Lots of windows that open and have screens make the house very airy and bright. Although we came in early August and all the other houses on the street were occupied we didn't find it at all noisy. The lighting in the kitchen could be better, esp. for evening food prep and clean-up, and also in the area around the couch, but the two main bedrooms had great reading lights. The third bedroom with bunk bed has a pretty lumpy double bed futon which my daughter found uncomfortable so if you use that room you might want to bring some kind of extra padding. All in all a lovely stay, and we'll be back!" 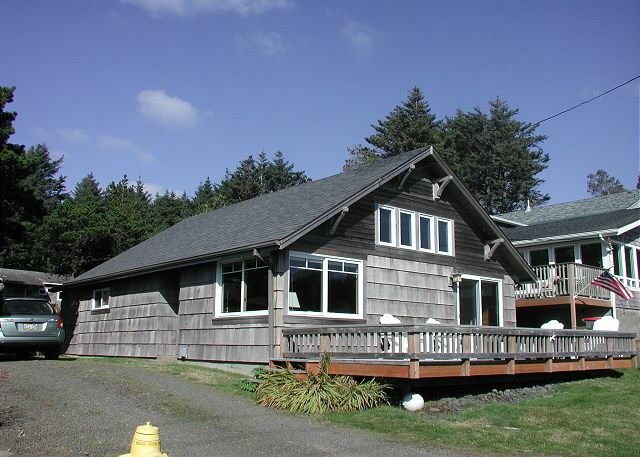 "We were very pleased with the location and easy access right down to Haystack Rock. The street was quiet and we played "kick the can" in the front and backyard. The house was clean and tidy and had a well stocked supply of cooking pans, utensils and knives! We enjoyed our week very much and would recommend this vacation home to any family with 6 or less people :o)"
"we've stayed in several of the homes available at cbpm - this one is hands down the best! bright, close to the beach, well appointed - we'll be back"
"Loved the home and all that had to offer. Location and couldn't ask for the great weather we received. " "This is the essence of a beach house, just a couple of houses from the steps to the beach with great views from the deck or inside windows. It is not a 4 star hotel, not should it be, quiet and comfortable furnishings with everything you need for a pleasant beach stay." "My husband and I and our dog had a good restful time in the rental. It was a great location close to beach and very close to Haystack. The house had everything we needed. Would have liked better lighting in bathroom and for reading . Loved fenced in area for our dog. We will be back. "Relaxing and restorative weekend at the beach. Turned into a beautiful weekend with lots of sun, surf and sand dollars. Nature's awesome!!!" "For us, this is a great cozy house with an excellent ocean view and a great price with a fenced in backyard for our dogs. Every year I come back to this house, it's like I was here last week - the owners and CBPM keep this home preserved in excellent shape. The walk in shower with detachable shower head/hose is SO nice for rinsing off our dogs - they have no fear/hesitation of walking into the shower whereas they hate getting into our tub at home. The kitchen is well equipped. You can stand anywhere in the living room, dining and kitchen and see the waves. The only suggestion I have is it would be nice to have a small table or tv tray available to the side of the sofa. Can't wait to come back next year." "It was a great house, very nice for having pets, with the fenced back yard. " "Very relaxing to be in Cannon Beach in off season. 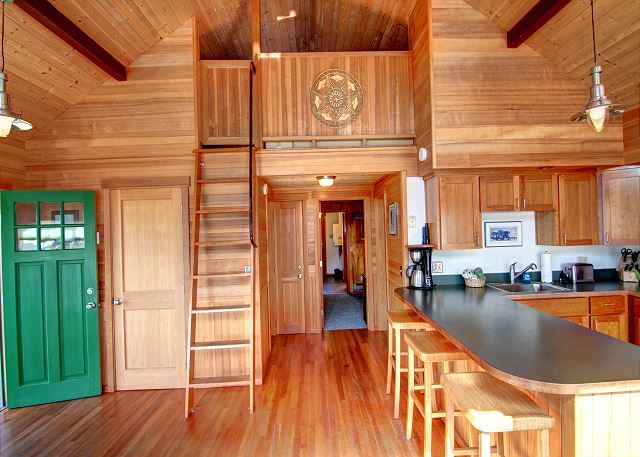 This house is two houses up from the beach, very near Haystack Rock. The back bedroom with bunk beds makes a perfect reading room to get away from it all!" "Our Babe's Beach House stay exceeeded expectations; great location and view of the ocean; easy and close by beach access; wi-fi service was great; hope to use again in future"
"As always over the last 9 years we have enjoyed our stay at the CBPM properties. Babe's is our favorite by far has everything our family enjoys. Deck, yard for the dog and great beach access. " "Babes's Beach House was a great place to stay. We were very close to the beach and Hay Stack rocks. Neighbors were very nice. The house was clean and well-maintained. My dog loved the fenced in back yard. The floor in the front bedroom was somewhat sloped, however. The main grocery store available was at Seaside, however, there was a smaller grocery store in downtown Cannon Beach (less than 5 min away)." "Cute house, great location close to beach and town. 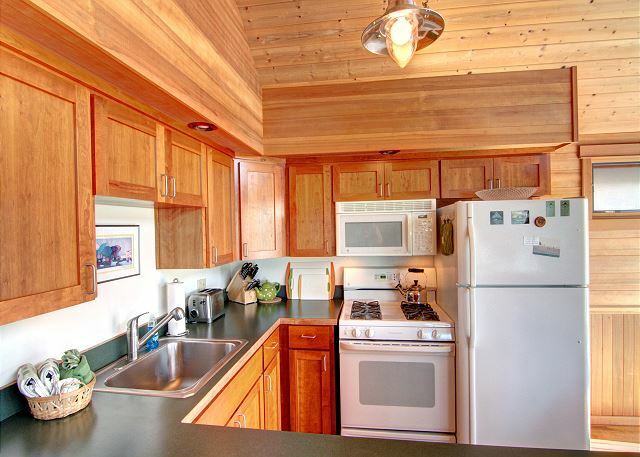 Pros: Very clean, stocked kitchen, great view from living area and easy beach access, working grill. Cons: Pictures taken from above led to thinking house was larger, loft is off limits. 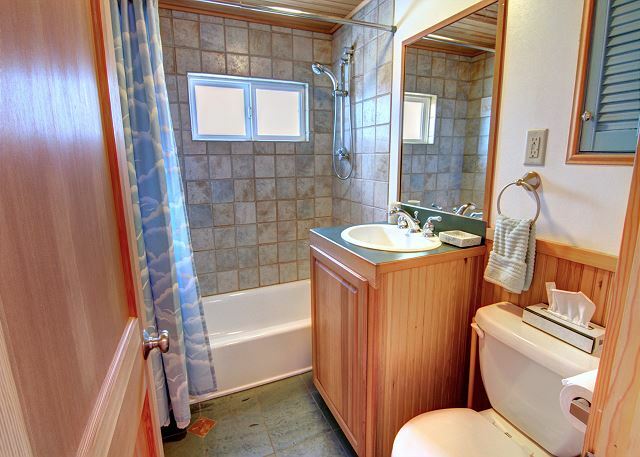 Also, 3rd BR access is through master and shares master bath, was not clear in description. Futon very difficult to reconfigure into bed--would recommend just leaving it in bed position for guests as no reason to be sitting in small BR w/ no TV. Would stay again though, perfect for 2 older kids and 2 adults." "Babe's beach house was a great place to stay for our family. Next time we visit Cannon Beach we will be staying here. " "Cottage was superbly equipped! Location is amazing! Would love to go back!" "We were able to share the trip with a young woman from Brasil who has never seen the Pacific Ocean. We all loved it! Wonderful home and perfect for dogs with the fenced in back yard. The front deck was fantastic!" "What a great three nights at Babe's Beach House! The weather was beautiful for the most part. 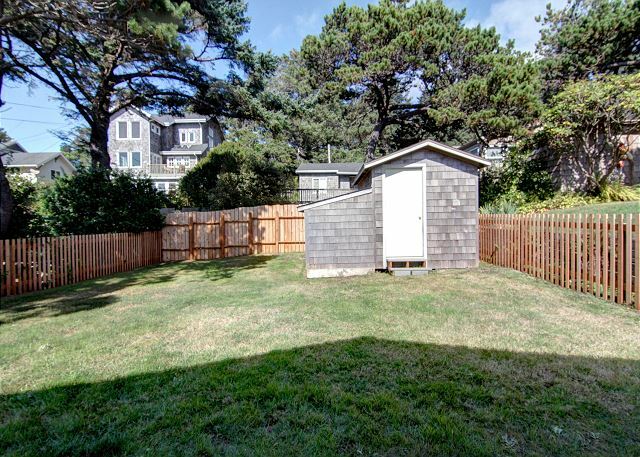 It's a great dog-friendly house with a fully fenced-in yard - with grass! We do wish the outdoor patio furniture was available to use. We also wanted to use the gas grill - called property management for key. The futon bed wasn't working properly, but someone did come fix it. We'll be back!!!" "What a lovely place to vacation! The house was clean & well maintained, the staff very helpful - especially when we wanted to use the BBQ in the sunny winter weather but it was locked away for the season. We will definitely be back! " "We had 2 storms in 2 nights. I will have to second the comments about needing a fireplace. Even an electric one that puts out some heat would make it cozier and take the chill off. Still love this place, though! And, we will be back!" 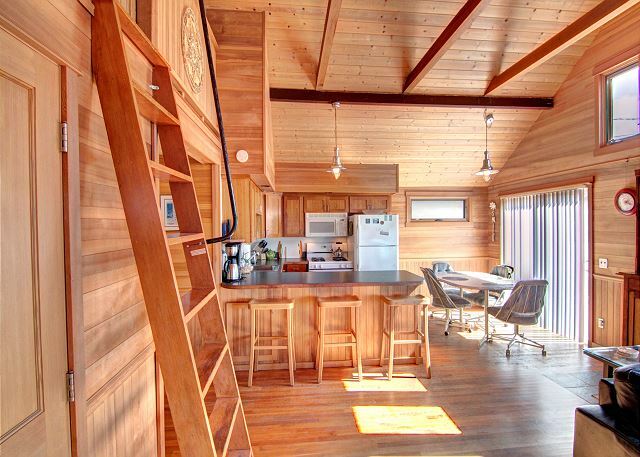 "Love coming to Cannon Beach every year, and love staying at this lovely home." "Very nice home. Well appointed and very clean. Will stay there again. " "Another great visit to Cannon Beach and always a good experience using CBPM. Stormy waves were a great surprise, enjoyed viewing from the deck of Babe's. Second stay at this property and will be return again next year. " "Babe's Beach House was great. Wonderful location with easy access to the beach. Great beach and ocean views from the deck and living room. House is well equipped. Bathrooms are very nice but could use some shelving or add'l storage. Front deck needs add'l furniture, particularly an umbrella and table. Hard to use the deck on sunny days without an umbrella. We will definitely stay here again!" "This is our 4th year staying at Babe's. We thoroughly enjoy the deck, proximity to the beach, and the quiet neighborhood. " "From the moment we drove up to the house we knew it would be a great week. A perfect location just two houses away from the beach, with a great ocean view, and a lovely front deck even our small dog could enjoy. The house was spotless and the kitchen very well appointed. And the CBPM staff were super friendly, helpful and efficient. The owners could invest in additional outdoor seating, and the pillows could be replaced, but these are minimal issues that didn't take away from us having an extraordinary stay. We'll be back and we'll stay at Babe's if at all possible." "You should have option to add more stars. Giggle. Great place. Super nice chk in /info at cbpm office. We all had super fun time relaxing amazing restaurant s in town. Fun shopping. Loved the bathroom in this house.. lol we took pics of it. And the washing /dryer .. just amazing.. forgot to write down the brand and model. Perfect size dishwasher. 10????! Thank u.. "
"We enjoyed the view of the ocean from the deck and living room. The beach access was easy for humans but we have older dogs and didn't take them to the beach as the steps to rocks was a bit tricky at the bottom. I think the next street over had easier access but we did not attempt it. I wish we had brought some throw rugs for the hardwood floors. Our dogs are used to carpet/rugs everywhere and slid arund a bit on the hardwood. The backyard had a picket fence which was nice with the dogs. The house was very clean and had everything we needed. We would stay here again." "We definitely will return to this home!" "We stayed here with our college age daughter, her friend, and our high school son. It accommodated all of us extremely well, giving us all our own spaces. We loved the beach view from the living room, and the easy walk to the beach. And Cannon Beach was such a lovely, relaxing little town. We would definitely come back!" "CBPM was great to work with, accommodated our late arrival...they even left the light on for us! House was in a great location, easy access to the beach with a great view from the living room. We were there on Spring Break...the weather was beautiful...but the deck furniture and the grill were locked up in the shed out back. Overall a nice stay." "The pictures don't do justice! The home is in a perfect location. 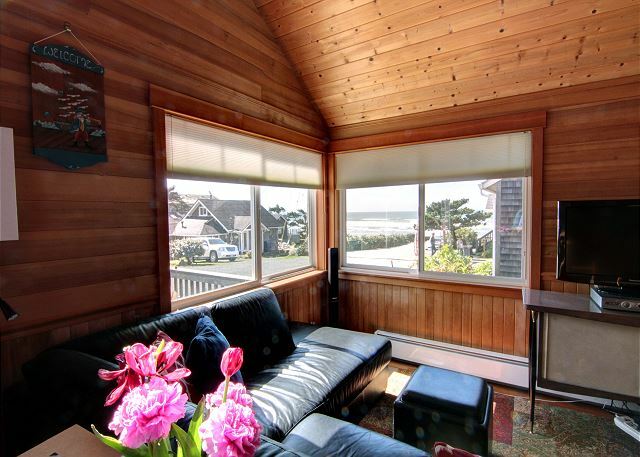 The beach is steps away with an amazing view of haystack rock. Downtown can be reach in a minute drive or from a nice walk on the beach. There were 4 adults 3kids and 2dogs and still managed to stay comfortable in this cozy house. The room with the bunk beds has to be reached by walking through another bedroom, which was strange but worked fine for us. We will definitely be back:) "
"Nice and relaxing as we desired. Back gate needs latch fixed"
"Love the house, love the location excellent ocean view, quiet street. Well equiped kitchen, newly remodeled bathrooms to die for. really niced fenced backyard for the dog. I love this property but it has only one flaw for me... The entire house has only one TV. If this is not an issue for you then rent this house you will love it. If your like me and seldom want to watch the same TV as my wife, then this may be an issue. Also this house has smokin fast wireless internet service. When they get a second TV installed I'll go back..."
"We had a wonderful time and will definitely be coming back to Babe's Beach House. The house was perfect for us - things were up to date and well kept." "This is a GREAT location on a quiet street just 3 houses from steps to the ocean and you get a fabulous view from the living room and deck that's off the dining room. The fenced back yard is a PLUS if you have a dog which I do so it was great letting her outside to do her business without having to be on the other end of a leash. 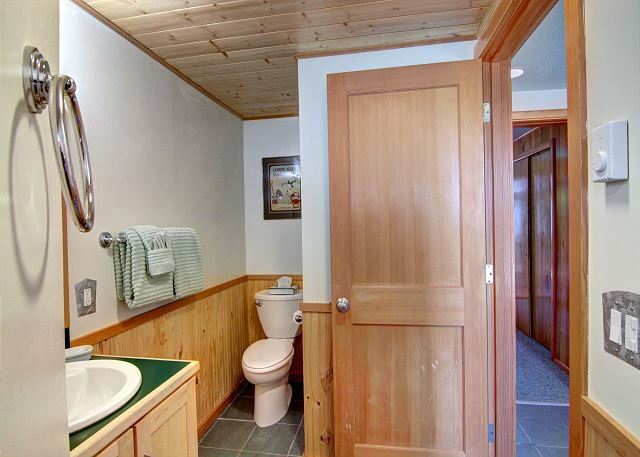 The house is compact, but laid out really well - and a bonus to have 2 bathrooms. Nice full size stackable front loader w/d. The back bathroom shower is a bit like a retreat - nice and spa like. The bed was comfortable too. I will definitely be back and will always look for this rental as first priority and always look forward to seeing my CBPM friends who do a great job with the properties and their customers." "I had the time of my life. I could live in this cottage by the sea. I did not want to leave this enchanted town. View of the ocean spectacular and walks on the beach by the Haystack memorable. Will make this a new Thanksgiving Tradition." "We had a great time. The weather was great. We brought our little dog for the first time to the beach and she enjoyed it & wanted to chase the bunnys." "We have rented from CBPM for the last 5 years. Babe's is now our favorite house. Great view, excellent neighbors,deck and yard for our pet. House is well equipped and perfect for couples or small families." "Wonderful house with a great location and view of the beach. The kitchen is very well equipped." "Visited 6 nights. Clean. Wonderful front deck with view of ocean, great for morning coffee and wine at sunset. 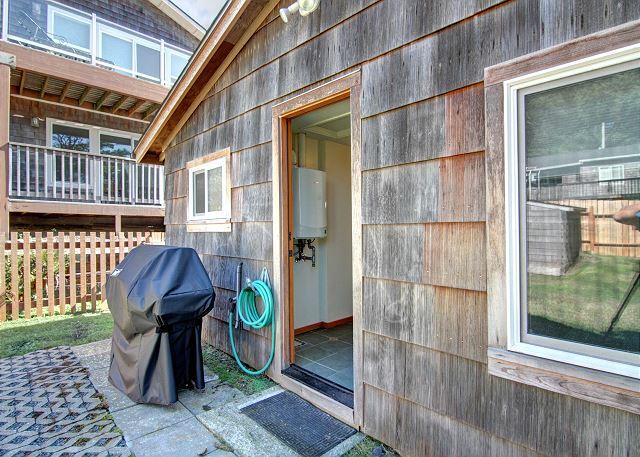 Only 3 homes away from easy beach access, Haystack a 5 min walk. Neighboring renters quiet, friendly little street. Kitchen was well stocked...would recommend owners leave space for renters to store food....lots of pots and pans, wonderful utensils, wine glasses and dishes, but no place to put food! Small dishwasher worked great. Large fenced backyard great for my Cavalier, plus front deck was enclosed so she could also be out there with us at all times. Appreciated the updated showers and the beautiful wood interior. Beds were comfortable, and very convenient to have washer/dryer available. Will rent again, best location for the price! THANKS!" "My my wife and 3 of our children stayed at Babe's Beach House. The view was amazing and the home is first rate. We had the best time. The home was cozy and inviting. We highly recommend the home. The backyard was fenced so the kids could play in the back yard. We had great time using playing catch. We would ask all tenants to clean up after their dogs. We found a few doggy presents in the back yard. That was only minor comment we had about our stay. We will definitely come back." "We had lots of room in a good location. We could walk out on the beach or just sit and watch on the deck. My family flew kites and rode bikes out on the Pacific. Great kitchen with lots of pots and pans. We cooked most of the evenings so the kitchen was great. We'd do it again." "We stayed here for our 10th anniversary. The place was great for our 14 month old daughter and our 2 border collies. Location is awesome!" "The house was clean, nice, a great location. wE Spent all of our time on the beach or deck. It was very relaxing." 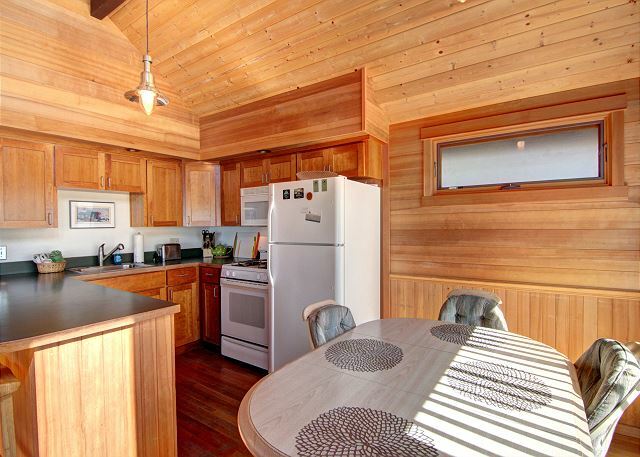 "We had a wonderful stay and were pleasantly surprise with how close this home is to the beach. The only thing that would make it better is a hot tub on the front deck! :) "
"We had an amazing time at Babe's Beach house. The house was beautiful,and it was steps from the beach. We locked ourselves out the first day, as Cannon Beach Property Management came to out rescue in minutes, after closing hours no less. I want to come back and have no problems recommending this house. Even our dogs had a great time. " "Home was clean and furnished nicely but not fancy or plush. Very close to beach, clean and tidy. Amenities (mattress, bedding, dining set) could have been better, but quite functional and comfortable. Kitchen was furnished well. View was wonderful for morning coffee & a book, and evenings on the deck. Very pet friendly property, and the beach, a few steps away, is dog heaven." "Location was just steps from the beach. Really enjoyed the whimsical bathroom touches!" "We have stayed here before and will again. We love it and so do our pets. This time, however, for some reason there were no knives that we could find to prepare food. Might need to bring your own. The house does need a fireplace, but otherwise, it is very cozy even in a wind storm when it's raining sideways! Beautiful home - wish it was available around the holidays." "Very please from when we got there through the time we left. The home exceeded our expectations by far. Thank you for making our stay a treasure we will remember forever." 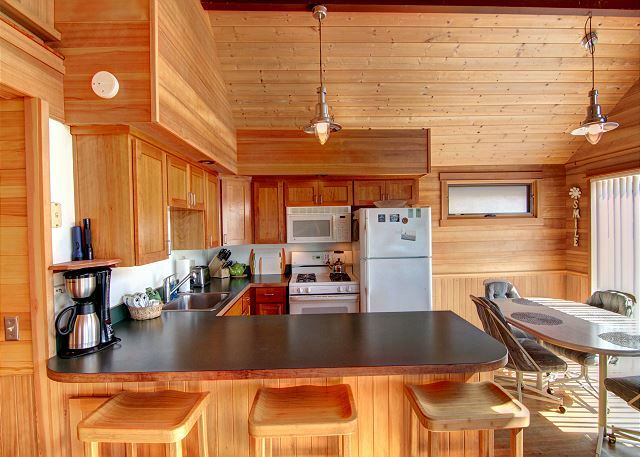 "We booked Babe's Beach House for a last minute winter weekend getaway for our family of five. I was blown away at the house--it was perfect! I couldn't have asked for a better location being just steps away from the beach. It was absolutely immaculate, and felt just like home. Anything and everything we'd need for cooking and then some, was right at arms's reach. Cozy, comfortable, clean....everything was just right! The view was amazing....I cannot wait to go back, I recommend both this house and CBPM without hesitation. Thank you for sharing this beautiful house with us, we enjoyed it thoroughly and will certainly be back!" "We stayed at this Cabin in July and enjoyed it so much that we came back in November for our anniversary. Even though it rained during our stay (which was no surprise), the cabin was a cozy place to relax and was a great convenience in getting to town and the beach." "The home is so wonderful! the view was amazing and it is cozy! The home was very clean. " "Great little beach house for a family of 4. awesome location. Hope to come again." the beach access. Good time, would return. Thanks!" "Great house very recently completely remodeled inside. Nice deck and view of the ocean. Only thing missing was a fireplace." "Babe's Beach House was great. Very clean, comfortable, and cute. Great location for the beach. 10 minute walk to Haystack Rock. Loved the view of the ocean. This house is great for kids, with a room at the back of the house and a closed off deck, you dont need to worry where the kids are. Kitchen was nicely equiped and the washer and dryer were awesome." "Nice neighborhood of beach cottages. Great view of the beach. A fenced yard for our dog. We will be back. (We couldn't give it a 5 cleanliness rating because there were old wine bottles under the kitchen sink. Otherwise it was very clean throughout.)"